With rows and rows of plump and doughy looking bagels, I thought it was a bagel shop. But no, it’s not. They’re not the traditional type with every flavor of cream cheese and a confusing amount of smoked and cured fish. I was corrected by the women behind the counter who seemed to be apologetic yet assertive that this concept was more of a cafe. However, they do make all of their bagels, so I grabbed a 7-grain, an everything, and an intriguing French Toast. Unfortunately, a sprinkling of powdered sugar and hint of cinnamon does not make this taste like French Toast. It’s really just a good egg bagel, but for $1.50 skip it and go for the others at 80 cents. 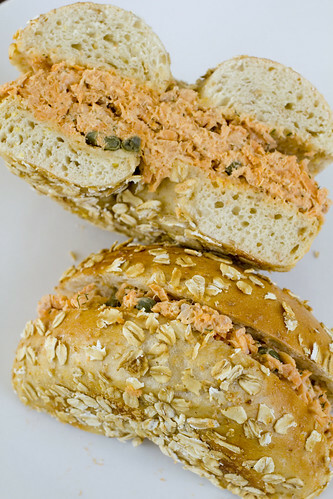 Their bagels are extra chewy, fun to pinch and pull apart, reminiscent of the ones at Hot & Crusty Bagel Cafe on 87th and Broadway (prior to 2004, then chef and/or recipe changed). The 7-grain has a wonderful honey and oat flavor. 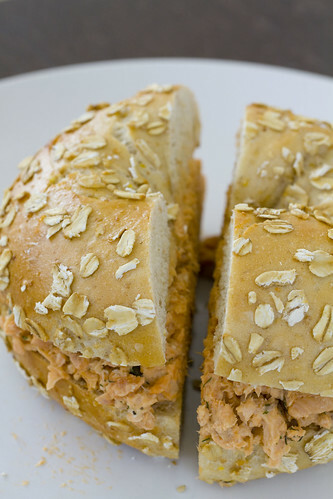 When I got home, Lon was ready for lunch and suggested a salmon salad for the bagels. When using recipes for canned salmon, keep in mind that different brands do vary quite a bit. 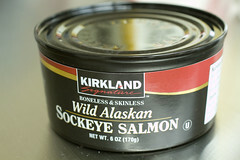 We seem to favor the Kirkland brand, both their Wild Alaskan Sockeye (which I used this time) and their regular Atlantic salmon. The wild is a lot leaner and crumbles more. Because of the variation in canned salmon, use this recipe as a guideline, adjusting for more or less moisture, more or less fat. I’ve noticed that many people use tuna salad as a fall-back when there’s nothing else around or you just want to save time and money, but stay healthy. I despise canned tuna, but I guess this salmon salad is my alternative. It’s just as cost, time, and nutrition effective. 1. 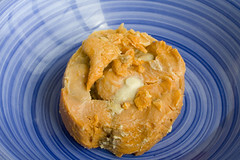 Drain the salmon but reserve 1 teaspoon of the liquid and place it in a medium bowl with the salmon. 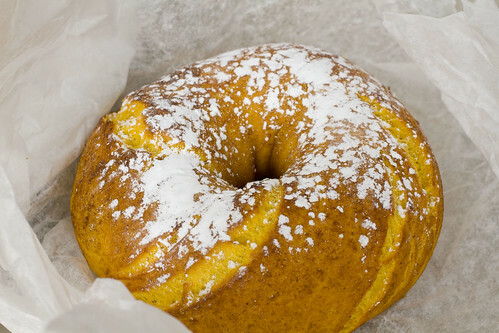 posted by jessica	at 11:32 AM	Filed under American, Breakfast or Brunch, Jewish, Recipes, Restaurants. You can follow any responses to this entry through the RSS 2.0 feed. Both comments and pings are currently closed. Hi–good luck with your new kitchen. When traveling in the Caribbean–I always kept my blender-toaster oven and hot plate! !Amazing what you can turn out with these small appliances. Nice sandwich! I get the salmon from trader’s joe. I also like to add some mustard too! You’re right by the 7 train, aren’t you? We just recently moved also, and didn’t have gas for the first few days. We ate take out a lot…luckily we had tons of options. Those bagels look so good! Nice recipe! 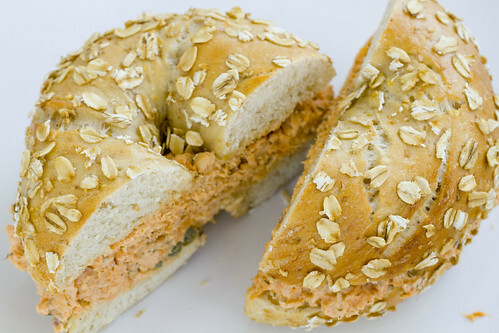 These bagels look delicious. Albany Jane, not sure how yogurt would be but worth a try. There’s not a ton of mayo in this, and doesn’t taste very mayo-y.